The chapter reveals the promise and pitfalls of racial-justice solidarity. In September 1923, a white woman in Mitchell County, in the mountains of western North Carolina, reported that she had been raped by a black man. Within hours, a white mob began rounding up black residents. Drinking whiskey and carrying guns, the mob marched their hostages to the local train depot, stopped a southbound train, and loaded them onto the railcars. Nearly a century after the ethnic cleansing, Mitchell County remains one of the whitest counties in the state. It’s also one of the most conservative—close to 80 percent of voters there supported Donald Trump in the 2016 presidential election. The county is represented in Congress by Mark Meadows, the head of the House Freedom Caucus. This article is produced in collaboration with Scalawag, a magazine about the South. All of which makes it more striking that Mitchell County and its neighbor, Yancey County, are home to a large, thriving branch of the NAACP. Formed in 2013, the Yancey/Mitchell County NAACP branch has around 140 members. Virtually all of them are white. 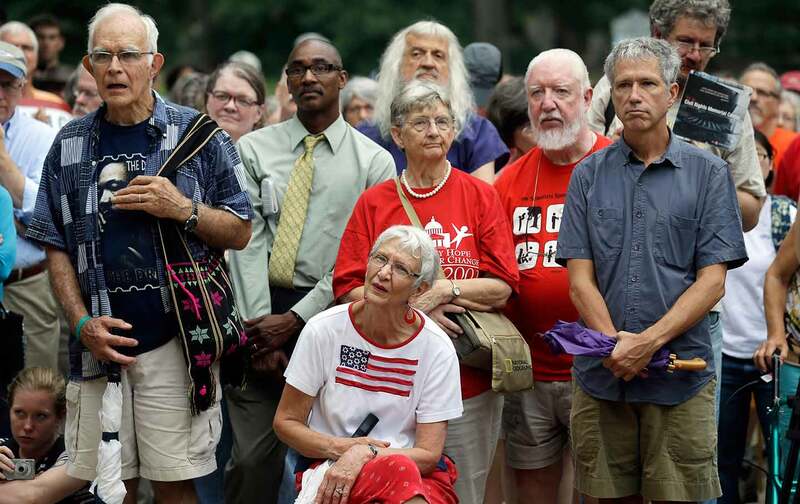 The branch has organized rallies, taken busloads of protesters to large events in Asheville and Raleigh, hosted public meetings, and, on occasion, stepped into local controversies. The branch’s success speaks to the potential for progressive organizing in Appalachia, and to the promise—and challenges—of building diverse coalitions in the 21st-century South. Traditionally, North Carolina state politics has had a progressive streak—the state is known for its higher-education system, among other large public-spending projects, and in the 1920s North Carolina was nicknamed “the Wisconsin of the South.” But in 2012, voters elected a Republican governor, Pat McCrory, and large Republican majorities in the state legislature—which almost immediately began cutting popular social programs. Drawing on a wave of progressive anger, the North Carolina NAACP, under the leadership of its president, Reverend William Barber II, launched the Moral Monday movement—a series of mass protests and acts of civil disobedience targeting McCrory and the North Carolina state legislature. Major rallies in Raleigh and Asheville attracted thousands of protesters. By the end of 2013, around 1,000 people had been arrested and released for acts of civil disobedience. People in western North Carolina were also disgruntled with the state leadership, and not just in the liberal strongholds of Boone and Asheville. “There was a great frustration about what we could do, because the legislature had gone crazy, everything was going backwards, and we couldn’t win elections because of this moral religious right,” said Wanda Woodby, a founder and the first president of the Yancey/Mitchell NAACP branch. “And then along comes Reverend Barber, who preaches that moral and social gospel, and the Moral Mondays, and that appealed to a lot of people, because there was so much pent-up frustration,” she said. In August of 2013, Barber preached for an hour at the Episcopal church in Spruce Pine, the largest town in Mitchell County, and there was a major Moral Monday event in Asheville the next day. Sensing interest in a more local action, Woodby and a few other residents decided to organize a Moral Monday event on the town square in Burnsville, the Yancey County seat. To their surprise, hundreds of people showed up. Hoping to keep that momentum going, some of the march attendees met again, this time with an eye toward forming a more long-lasting organization. Even though the group was virtually all white, they decided to approach the NAACP. The group did consider joining a different progressive organization. But, Woodby said, “When you read the constitution and what the NAACP stands for, it was more what we believed. And when you listen to Reverend Barber with the moral message—this is what we believe. This is what touched people.” Other attempts to start progressive organizations in the area had often lasted a few years and then fizzled. The NAACP, though, had been around a long time, and it offered a statewide network. When we met in May, at a café in town, Woodby, who serves as an elder at the First Presbyterian Church of Burnsville, insisted that there’s a real progressive streak in the mountains, although it’s often eclipsed by culture-war wedge issues. “You scratch beneath the surface of some of these old guys, that you think are very conservative—they’re not, because they’re really Roosevelt Democrats,” she said. It’s true that progressive action has a rich history in Appalachia. The Highlander Center, in the mountains of east Tennessee, has been a hub of civil-rights organizing in the South since the 1930s. Some of this country’s most important pro-labor and pro-union fights took place in the coalfields of southern West Virginia and eastern Kentucky, as well. There’s active environmental organizing, youth organizing, and cultural work there that continue today. The substantial majority of the branch’s members are transplants—part of a wave of people, many of them retirees, who have moved to western North Carolina from other parts of the country, drawn by the mountain scenery, cooler weather, and cultural ferment in places like Asheville and Boone. But its leadership is more local: Robin Ellis, the current branch president, grew up in Mitchell County. One of the three vice presidents, Ray Williamson—who is one of the branch’s two black members—was born a couple hours away in Shelby, North Carolina. Woodby lives on property in Yancey County that her family has owned for 140 years. As an overwhelmingly white branch, the Yancey-Mitchell group runs the risk of eclipsing, and even causing trouble for, the small but vibrant black community that does live in the mountains. Earlier this year, I met with Shirley Whiteside and her son, Bill Whiteside, at the Burnsville public-housing complex where Shirley lives. We sat down together in one of the facility’s common kitchen areas, at a formal wooden table, covered in a tablecloth, that stood next to a pair of vending machines. Shirley’s family has deep roots in the area. Her grandfather, she said, used to carry a gun to the polls, worried that white people would attack him when he tried to vote. In 1960, Shirley integrated East Yancey County High School after her family, represented by NAACP lawyers, sued the county for admission. Nearly 50 years later, Shirley held a Bible as Bill was sworn in for a seat on the Yancey County school board. Despite all this, Shirley is not optimistic about progress in the region. “It’s not changed all that much,” she said. When Shirley brought up the new NAACP branch, she sounded bemused: “The majority of the members of the NAACP right now, that’s over at the church I used to go to, are white!” she told me. “Which is no problem,” Bill added. “That blows your mind, doesn’t it?” Shirley said. The post was eventually deleted, but not before local government got on board. Both the Mitchell and Yancey County sheriff’s departments shared the thread on Facebook, NAACP members told me. She felt like the tone changed once state-level NAACP staffers started working with the group. And she described being part of the NAACP as a learning experience for many of the branch’s members. As white people, she said, “we don’t understand, you know what, things take a long time to change.” That impatience can still cause tensions; recently, a disgruntled white member quit the chapter, arguing that their activism was moving too cautiously. The test of the local branch will not just be its ability to organize rallies or bring busloads of protesters down to Raleigh but also its capacity to serve as an ally for local communities of color. They are doing some of this work—the branch has begun quietly putting pressure on a Yancey County school to respond to a racist incident that occurred there earlier this year, and they’ve been called in to check on a prisoner whose family was concerned about his treatment at the state facility in Mitchell County. “There are more young black men in the [nearby] prison facilities than there are in all four counties,” said Travis Wynkoop, the pastor of the Griffith Chapel Zion church in Burnsville, referring to the larger Yancey, Mitchell, Avery, and Madison County region. State census and inmate data suggest that he’s not far off. When Wynkoop isn’t pastoring at AME Zion, his mostly black church, he works in the prisons. He has also joined the local NAACP branch, which now holds its meetings there. Michael SchulsonMichael Schulson is a freelance journalist and a columnist at Undark Magazine.